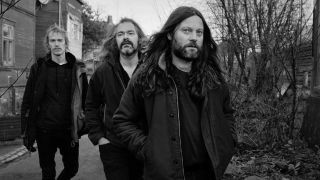 Motorpsycho have announced that their latest album will be released on February 12. Here Be Monsters was written by Stale Storlokken and recorded by the Motorpsycho trio of Bent Saether, Hans Magnus ’Shah’ Ryan and Kenneth Kapstad. It was recorded at Trondheim’s Nidaros Studios and co-produced, engineered and mixed by long-time collaborator Thomas Henriksen.